It's the '80s once again, and the John Hughes-styled high school comedy gets a fresh twist in this touching, coming-of-age tale. New wave angst and gender-bending fashion are all the rage, but the new kid at school, Chance Marquis (Tad Hilgenbrinck of American Pie Presents: Band Camp) is trying to find new ways to stand out. Being an odd and somewhat awkward teenager makes him the target of the school bully. To deal with this dilemma, Chance turns to the opposite ends of the high school spectrum for help. On one side is the flamboyant drag queen and on the other, the varsity jock, Levi Sparks (Brett Chukerman of Eating Out 2) with whom Chance develops a unique friendship. Chock-full of the comic conventions of the high school genre - the idiot faculty, the good-hearted but delusional parents, the fairy tale reversal of popularity - The Curiosity Of Chance is a frothy bit of nostalgic filmmaking. But knowing the genre doesn't mean its story won't also touc h your heart, as Chance battles the bigots to make high school the diverse utopia it should have always been. Guaranteed to ship today if ordered within the next 3 hours and 2 minutes. In The Curiosity of Chance, his feature film debut, writer/director Russell P. Marleau pays homage to the '80s high school comedies of John Hughes and switches the perspective to that of an openly gay teenager. We follow Chance Marquis (Tad Hilgenbrinck), a fashionable new student at an Americanized European High School for army brats. He is instantly picked on by Brad (Maxim Maes), the egomaniacal school bully, for wearing a bow tie and top hat on his first day. After joining the newspaper, he befriends Twyla (Aldevina da Silva) and Hank (Pieter Van Nieuwenhuyze), two fellow outcasts. With their aid and a little advice from a drag performer named Claire Vuoyant (Danny Calander), Chance may be able to overcome persecution from Brad, the vindictive and highly unhygienic Vice Principal Smelker (Magali Uytterhaegen) and his own military-obsessed father (Chris Mulkey). During all this, he finds time to experiment with female impersonation and tries to win the heart of Levi (Brett Chukerman), the hunky blonde jock/musician next door. Featuring a varied cast of fresh new faces and an ample soundtrack of pop hits from the '80s, The Curiosity of Chance is out to charm and strike a nostalgic chord. 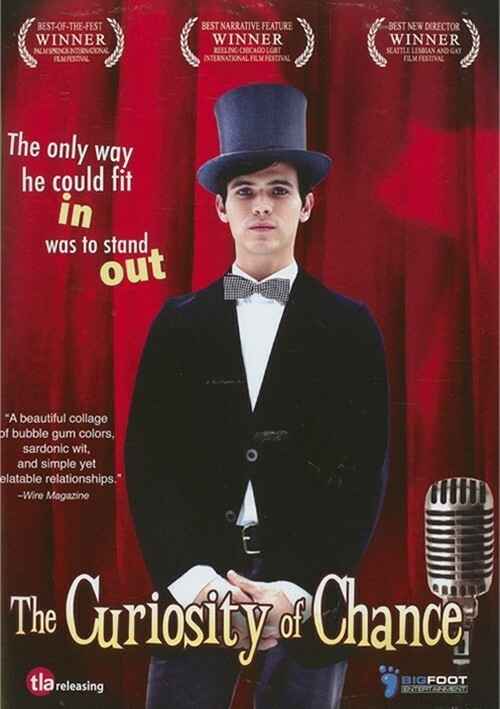 "The Curiosity of Chance" is one of those movies we have been hearing about for quite a while and it has taken a long time to make it to DVD. It has been quite a hit on the festival circuit and now all of us will get a chance to see it. Written and directed by Russell P. Marteau gives us a high school comedy that is a coming-of-age story which takes place in the 1980's-- a period of angst, uncertainty and gender-bending fashion. Chance Marquis is the new kid at school and he is taunted by the school bully because of his awkwardness. Looking for a way to deal with this, Chance looks to the opposite ends of the school spectrum. On one side is a flamboyant drag queen while a varsity jock is on the other. Naturally comedy ensues which involves the school, the faculty and Chance's misguided parents. Yet the movie is also very touching so it is a hard one to classify. This is an independent and low budget film but that does not deter from the fact that all of us should be able to identify with aspects of the plot. The cast is made up of outcasts who spring to life and act their behinds off. This is both a teen comedy and a gay movie but the gay aspect is not shoved into the viewer's face. "The Curiosity of Chance" deals with tolerance and how we come to accept. To say anymore about the film would ruin your viewing experience. Take my word and see it and enjoy. This is a 'Coming Of Age' film, with the main character involved with his ajustments to his life and the myraid of events and quasi-disasters surrounding his high school days. This film shows quite poignantly the confict with parents and school officals by the main character. This hit a little to close, to home, for me, as I was in many very difficult situations in high scool also! I really beieve in the over all theme of this film and hope that parents can view this for what it truly is. ADJUSTING DURING ADOLESCENCE CAN BE DIFFICULT, BUT BEING GAY IS PURE HELL!!!!! NJMJr!! .......gratuitous (although it is a good lip-lock). ((a)). It's cute, it's innocuous and it's in no way innovative. What it does do is rein---in a fun way---the principles of standing up for oneself, appreciating the friends one does have and, most importantly, keeping hope (re: that last 2-person scene in this movie). ((2)). This definitely will appeal to the high school crowd (what's really going' on here---is this just a little different take on the "High School Musical" theme?). ((c)). Just a thought or two about our leads---Hilgenbrink: a little "one-note" in his come-across (but at only age 23 or so when shooting, and with not much in past filmed performances, he has the greater potential of the two male leads) // Chuckerman: just because you're cute doesn't mean you can act (gonna get in trouble for that one---from the girls, maybe the boys) and gave a rather wooden performance (he was much better at "dragging us into the picture" with his performance in the year 2000 Short: "Crush"). Do have to allow him this, though---the facial expression he gives us, while walking away after "the kiss," was a priceless moment // Aldevina Da Silva's work here was tippy-top above the rest. If there's an award for this sort of thing, it belongs to her. ((2)). PS--If you want something better in the gay teenager mode, try one of these: "C.R.A.Z.Y" // "Summer Storm" // "The Mudge Boy" // "The Last Day"